posts – The Adam Lindsay Gordon Commemorative Committee Inc.
MONTFORD, PAUL RAPHAEL (1868-1938 was born in London in 1868 and learned modelling from his father, Horace Montford. He studied at the Royal Academy schools and became internationally known. He married a fellow artist, Marian Aglio Diblin, on 11 September 1912. 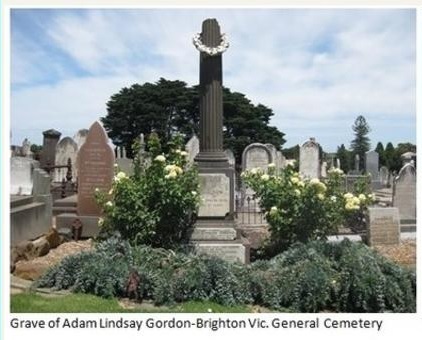 They emigrated to Australia with their family in 1923 in answer to an advertisement by the Australian Government for sculptors to enter submissions for an ANZAC memorial to honour soldiers killed in Egypt, Palestine and Syria that was to be erected at Port Said. Paul Montford arrived in early 1923 with his model sculpture for the competition and was optimistic about his chances, but he did not win. He then decided to take up a teaching post at the Gordon Technical Institute in Geelong. In 1925 he decided to move to Melbourne, to 20 Bruce Street, Toorak where he rented a colonial villa in poor repair and set up his studio on the ground floor with living quarters above. Montford’s involvement with the Shrine began in November 1922 with the announcement of a competition for the National War Memorial of Victoria. The project did not really go ahead until on Anzac Day 1927 when a rousing speech by General Monash reinvigorated enthusiasm for the scheme. In November 1928 a standing design for a statue of Adam Lindsay Gordon had been accepted by that memorial committee, but later changed to a figure in a seated position. Walter David Webb posed in the chair for the correct seating position and George O. Ross Fenner who knew Gordon stood beside Montford as he worked to get the correct facial features. In July 1931 the completed model, cast in plaster, was displayed in the Athenaeum Gallery Melbourne together with paintings by Mr. Murray Griffin. The cost €1650. The model was sent away for casting and in July 1932 Montford announced that it was on its way back to Australia and the statue was unveiled on 30 October 1932 in the northern end of the reserve next to the Victorian Parliament House, Melbourne. Charles Gordon “A kind of cousin of Adam” stands at the southern end. The Royal Society of British Sculptors awarded Paul its gold medal for the best work of the year. Montford was president of the Victorian Artists Society 1930-2. 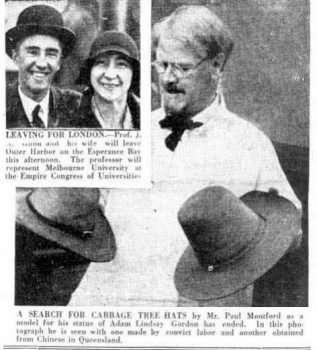 Montford died after a short illness of leukemia on 15 January 1938 in Richmond, Victoria; he was survived by his wife and two daughters and a son. His ashes were scattered in the woods at Leatherhead, Surrey, England. 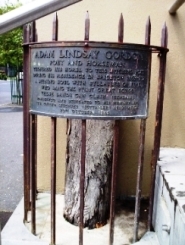 The Life and Best Poems of Adam Lindsay Gordon. Douglas Sladen; The Age Tues 3 Nov 1931 p8. LONDON. April 26. – There are remarkably interesting associations about the woman sculptor who was chosen to do the bust of Adam Lindsay Gordon. “National Poet of Australia.” which will be unveiled in Poets’ Corner, Westminster Abbey, by the Duke of York on May 11. Lady Hilton Young, as well as being one of the most prominent English sculptors of today, was the wife of the gallant but ill-fated captain Scott who explored so much of the Antarctic and died when returning from the South Pole in 1912. She is now married to the Right Honourable Sir Edward Hilton Young, G.B.E., D.S.O., M.P., Minister of Health in the present Cabinet, and her elder son, Peter Scott, is the god-child of Sir James Barrie, and a rising young artist. I met this stimulating woman at her home facing Kensington Gardens a few days ago and was impressed by her crisp, direct manner. She was unwilling to dwell on personal details about herself, but where her sculpture was concerned was all alertness and enthusiasm. She led me straight through a spacious drawing room, down some steps and into one of the most charming English back gardens that I have seen – all trees, shrubs, lawn, and crazy-paving, with, in the centre, a small pond. At the corners of the garden some of Lady Hilton Young’s own sculpture stood upon pedestals. Lady Hilton Young formed her conception of Gordon largely from reading his poems. For his outward appearance she had astonishingly little to guide her – only one old daguerreotype and a photograph of the statue of Gordon by Montford which was unveiled in Melbourne in 1932. This, Lady Hilton Young wisely observed, so that a traditional record of Gordon’s appearance might be preserved. She is an extraordinary quick worker and she told me that this bust of Gordon was modelled in about a month after she received the commission. Naturally, as it is her first memorial to be placed in the Abbey (it is the first to be placed in Poets’ Corner since Tennyson died), she is particularly interested in and careful about this piece of work – so interested and careful that she has had two bronze heads cast, and she is going to carve another in stone and choose which one looks best in the setting. About me in her studio were many heads of famous men sculptured by her hand – political celebrities, like Asquith, Baldwin, Lloyd George, John Simon and James Maxton, writers like Shaw and Galsworthy, and explorers like Nansen and Scott. I had noticed in her drawing room a bust of Stanley Melbourne Bruce. Lady Hilton Young told me that it is a very recent work and she would like to see it set up somewhere in Australia. I suppose no woman sculptor has as many memorials to her credit in different parts of the world as this energetic sculptor. In England alone she has about a dozen outdoor statues, including war memorials, and there are others in India and New Zealand. Throughout a great deal of her work I could trace the influence of Rodin, the French master-sculptor, under whom she studied in Paris. In fact, she is quite an open-air woman. She likes working outside in the garden when weather permits, and for this purpose she has a movable throne which can be wheeled about. She told me that she likes larger-than-life-size work best as it gives the sculptor more scope; and, not content with the ordinary physical strain of modelling and stone-carving, Lady Hilton Young cuts her own marble. Strangely enough she has never recorded her own sons in either bronze, stone or marble. It happened that her elder son, Peter Scott, was having his second Bond-street “one man show” of paintings of wild fowl opened on the afternoon after I visited Lady Hilton Young. She kindly invited me to be present. It was quite a distinguished little gathering because the opening speech was given by Colonel John Buchan, M.P., the prominent novelist, and among the guests were Sir James Barrie, and Mrs. Stanley Baldwin and Sir Edward Hilton Young representing parliamentary circles. Colonel Buchan said that Peter Scott was following in his father’s footsteps by being an explorer in an intensive way into the abundant natural bird life of England. Mr. Scott’s paintings of all varieties of wild bird life studied and depicted among their native surroundings on the mud flats and fens of Norfolk, betray an intimate knowledge of an interest in natural history. I heard that it was among his heroic father’s last wishes that his son, then only a baby of one year, should study natural history. Among Peter Scott’s paintings was a charming interior of the sitting room, with its old ingle-nook fireplace, of Sir James Barrie’s home in Adelphi, the dramatist himself being seated by the fire. Mr. Scott’s life has been closely linked with associations of his god-father. Barrie’s immortal “Peter Pan” was written in the room which is now Peter Scott’s studio, and Mr Scott was named after “the boy who couldn’t grow up.” Then Peter Scott loves wild ducks, and two from the Round Pond (the haunt of Peter Pan) have come and settled of their own accord on the pond in Peter Scott’s garden. A young man with such a talent and associations is marked out for fame from his birth. See also Sir Peter Scott Founding father of the World Wild Life Fund who also created their Panda mascot. We are pleased to announce that a protective cap has now been placed on the top of Adam Lindsay Gordon’s hitching post outside Brighton’s The Marine Hotel (Victoria) and we thank the Marine Hotel management for providing us with a photo of the cap which was manufactured and installed by Greg Harris of Greg Harris Sheet Metal, Ballarat. Members and friends have kindly donated $740 to our Hitching Post Fund. The overall cost for metal cap and descriptive plaque was $777.34.